Hey everyone! It's Angie here from The First Grade Scoop. Fall is definitely crunch time around here... I feel like I'm just barely skating by! I don't know about you, but each year, I find things that work for the most part, but need tweaked to make them better, more functional, and easier to deal with for the students (and their parents... and me!). One of those things this year was homework. I'm not crazy about homework in the first place, but a) it helps develop some responsibility that our students need and b) we are required to give it, so I try to make it meaningful. 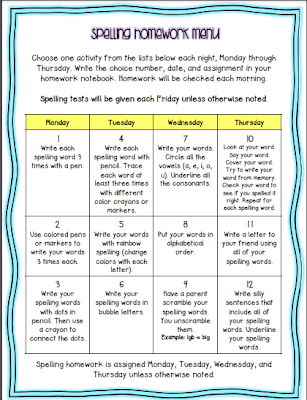 Several grade levels at my school have a home learning packet, which is given on Mondays and due on Fridays, in which students complete some sort of word study work and reading responses. I had one the past couple of years, and it seemed to work well. 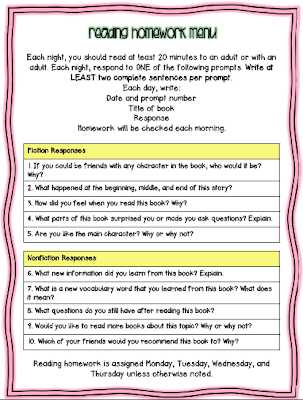 Students could work ahead on some things if there was a busy night later in the week, and they practiced responding to reading much like they did in reading workshop. But it was SO. MANY. COPIES. We had basically one side of a page each night, and then I'd attach our Home Links (from Everyday Math). A stack of 30 to go through each week? YIKES. Then I got an idea while talking with one of my team members... Why not make a homework notebook? Okay, so this isn't too radical, but it has simplified my life dramatically. Each student uses a composition book for their homework notebook. On Monday afternoons, we glue our words for the week (word study words from leveled Words Their Way sorts that we're working on in class) into the notebooks. Each student also has a homework folder with a "menu" of spelling choices, as well as a list of reading response questions. These are printed on cardstock and in page protectors in the prongs of the folder. 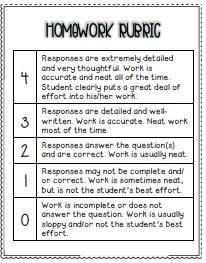 I staple the rubric in to each student's notebook and circle the score, writing notes in the notebook if necessary. 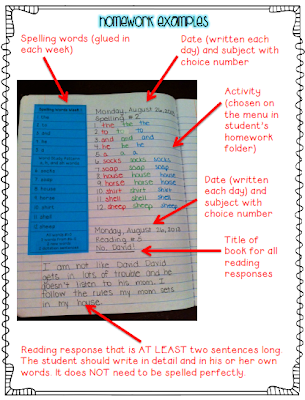 This has worked REALLY well for students who might be missing homework - it's easy to document this in the notebook and there's less of a "but I turned it in" issue. So far, this has worked really well for my students, and it's been a lot less prep for me (and fewer trees for copies). I hope this helps you and your students! Have a great night! I love you ideas for homework. I tried to download the pages, but it said the file was deleted or moved. Will you please repost, I'd love to use it this year. Thank you! Happy Halloween Sight Word Style! Only 1 iPad? No problem! Are Your Kiddo's Into The Mustache Craze? Math Stations and Holiday Freebies! Birthday Freebies and a Clipart Giveaway! Halloween Musings, and a Pumpkin Party Freebie! Recess Rants to Recess RAVES!